This machine is mainly used for industries such as pharmaceuticals, chemical, metallurgy, foodstuff, and architecture etc. The machine adopts wind-wheel-type high-speed revoving knife and stationary knife to carry out impacting, milling and shearing materials. Not only the crushing effrct is good but also the strong air stream produced in the chamber while crushing will bring heat energy and finished product to flow out from the sieve together, you can change powder fineness. This set utilizes the relative motion between the movable fluted disc and stationary fluted disc, which makes the material crush through impacting of fluted disc, rubbing and impacting between the materials. 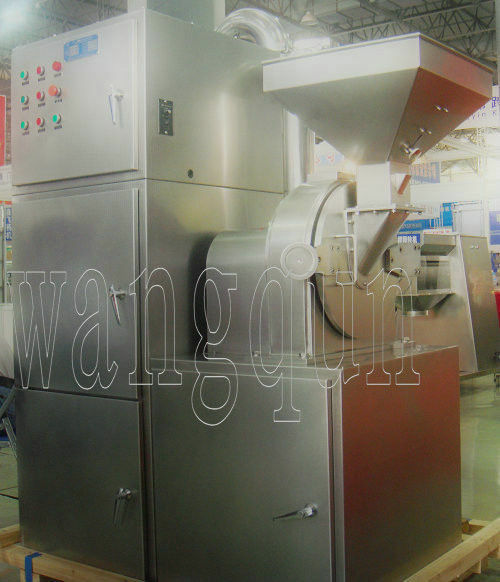 Affected by rotating centrifugal separator, the crushed material enters automatically to the arresting bag. Dust will be discharged through the filtration of cloth bag of suction box. This machine is designed according to GMP standard, and made of stainless material totally. There is no dust to fly during the period of production. used for industries such as pharmaceuticals, chemical, metallurgy, foodstuff, and architecture etc.